When I moved into my first apartment, I spent a lot of weekends trying to figure out pancakes. They seem so simple, but bad pancakes are really terrible — burnt on the outside, raw on the middle, flavorless, soggy, sodden, spongy. I ate some real losers. The recipe of choice in our house growing up was from the brown, crumbling edition of Fanny Farmer my mother had probably received as a wedding gift. But when I tried it, the pancakes came out flavorless and kind of gooey inside. Gross. If you still haven’t found a reliable pancake recipe to guide you through bleak times (like, a late night at work and a seven-year old coming over for dinner), let me offer this one. It’s from the folks at Cook’s Illustrated, so, of course, it’s slightly fussy (you have to separate an egg, and then say a little spell and add the parts of the egg to the buttermilk and melted butter in a very particular order), but it’s worth it. These come out great every time; crispy on the outside with a light and fluffy interior. And here are two other tips for pancake making. First, use a griddle. You can make almost the whole batch of these at one time on the griddle, the cakes are easier to flip, and it is easier to maintain the heat when you add the batter. Second, fry some bacon first. 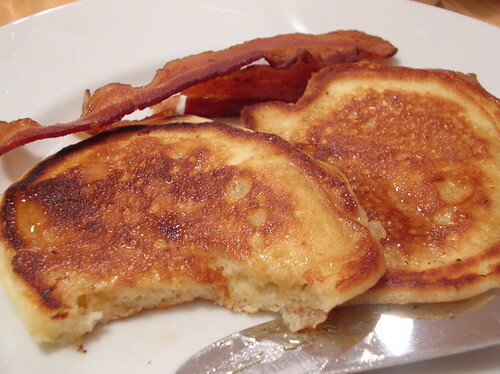 Bacon fat gives the most deliciously salty, naughty flavor to the crisp edges of the pancake. 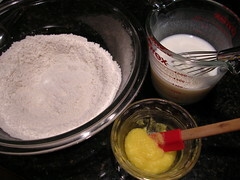 Whisk dry ingredients together in medium bowl. Combine buttermilk and milk in a 2-cup measuring cup. Whisk egg white into milk mixture. Stir egg yolk into melted butter then pour butter mixture into milk mixture. Pour wet ingredients into dry ingredients and whisk lightly and quickly, just until combined. Heat a griddle over medium-high heat (or, if you’ve been frying up a bunch of bacon on your griddle over low heat, increase your heat to medium-high). Generously grease the griddle with vegetable oil (or bacon fat – yum!). Ladle batter, about ¼ cup at a time, onto griddle. Do not over-crowd the pancakes. 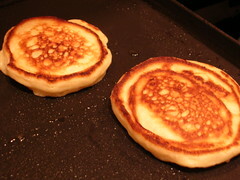 When the first side is brown and little air bubbles have begun to form on the surface (2 –3 minutes), flip pancakes and cook second side (1 –2 minutes longer). Serve immediately with butter, maple syrup or jam. Serves 2 – 3 pancake lovers. This entry was posted in breakfast, dinner, pint-sized diners, Uncategorized. Bookmark the permalink. I love breakfast for dinner. Two thumbs up. That recipe is probably better for dinner. In the morning I would be cursing those prigs at Cook’s. I also heartily approve of breakfast for dinner. Ellis has no idea what he’s been missing! Add some blueberries to those pancakes and you’d get a perfect 10 from me.